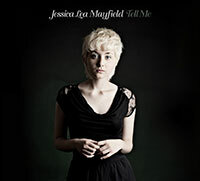 Tell Me, the stunning sophomore release from singer / songwriter Jessica Lea Mayfield is coming early next year. Produced by The Black Keys’ Dan Auerbach, the album follows Mayfield’s acclaimed 2008 release With Blasphemy So Heartfelt. Tell Me is currently available to pre-order and you can Downloadthe first single “Our Hearts Are Wrong” for free and get your first taste of Tell Me.